Functional Wellness means: Rather than targeting individual symptoms, focuses on the optimal functioning of the entire body and its organs. We are enthralled by the captivating motives of humanity in constant reach of always renewing ourselves, understanding this magical and mystical being which we call our body. Please join the Los Angeles 5D event exploration of the five precepts which we consider to be fundamentally allowing ourselves to further Quantify & gauge the following “Health, Body, Mind, Soul & Business”. Within these two days, we shall have the most prominent speakers in each area of those dimensions which will discover and engage with workshops, lectures & panels on some of the most prominent questions in our lifetime. 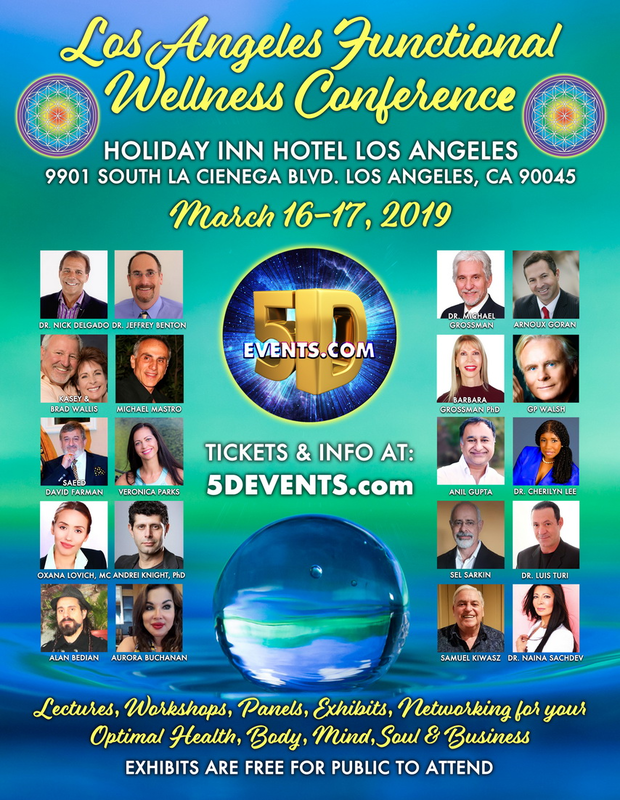 Amazing epic event is about creating a better future with Quantum Consciousness, Stem Cell Research, Anti-Aging, DNA Activation, Longevity, Quantum Healing, Business & Life Mastery plus many more topics with Keynote Speakers giving over Lectures, Workshops, Panels, Exhibits. Dr. Michael Grossman, Dr. Nick Delgado, Dr. Jeffrey Benton, Dr. Naina Sachdev, Dr. Cherilyn Lee, Dr. Barbara Grossman, Dr. Luis Turi, Anil Gupta, Arnoux Goran, Saeed David Farman, Sel Sarkin, Brad Wallis, Kasey Wallis, GP Walsh, Veronica Parks, Oxana Lovich, Andrei Knight, Ph.D., Alan Bedian & plus more to come. ***Must be 18+ to attend, no kids, pets, drugs, alcohol, backpacks, video recording or outside food or drinks are allowed. 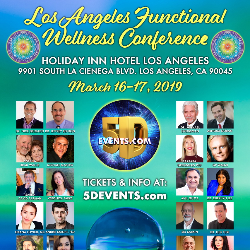 5D Events: Group of advanced souls who influence the future timelines by raising consciousness and bringing new ideas in science, health, functional wellness, technology & ecosystems. Dr. Michael Grossman, Dr. Barbara Grossman, Dr. Luis Turi, Anil Gupta, Brad Wallis, Kasey Wallis, Andrei Knight, Ph.D.
A lack of Consciousness brings a nation down and raising levels of Consciousness make a nation happy and prosperous! At this panel speakers expand on consciousness and how to implement on our lives, change the future for better, Julius will also represent the 3 highest levels of Consciousness, Super Consciousness, Hyper Consciousness & Ultra Consciousness. These are the creative and thought fields of full empowerment including reconfiguration of the physical embodiment and more. The last hour of the panel speakers & Julius will answer questions by the audience that no one seems to have an answer for, and they are important. Julius is an ascended collective Consciousness group. They have been human on this realm and ascended themselves by raising their consciousness to a Hyper Consciousness state. Brad Wallis met them during his near-death experience in 2007. When he woke up in the hospital Kasey began trans channeling Julius. Thru Kasey Wallis channeling Julius they assist Humans to resolve all limitation in their lives by raising their consciousness. This panel is designed to deliver to information of how empowered we are to create our experience. No matter how limited things appear in our lives. Health, money, love relationships, you can resolve and better than that master and expand your experience thru thought or Conscious creative energy engagements. Door Tickets are going to be: $120 or $60 per day covers full event, all lectures, workshops, panels and exhibits. ***Exhibits: Exhibit area is free to visit for public from 9 AM to 6 PM (over 30 exhibits).